Berry blast and summer time! Summer is filled with brightly colored, fresh ripened, and succulent berries. 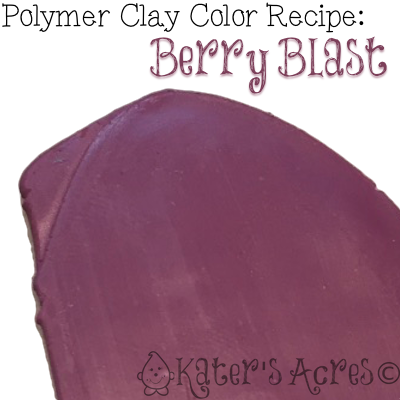 This beautiful very colored polymer clay color recipe will delight the eyes in this muted cool toned color. I am a color addict. One of the things that I do in my studio (when I don’t know what else to do) is to sit and make some new recipes and just “play” around with clay. There’s a very easy way to make your own color recipes that don’t require a lot of thought or effort (or large amounts of clay either). If you are interested, make sure that you read this article on Making a Color Palette 101. It will not only show you my process, but show you how to break out and stop using colors straight from the package. Looks great as an accent with turquoise or any blue clays because of it’s blue undertones. Pair with white acrylics or inks to help it stand out in the crowd.